Sometimes I find a great recipe, but just don’t want or need to make the full recipe. You know, those times that you want to make a dish, but you know that your kiddos won’t eat it, so you don’t want to waste food? Or when you find a terrific recipe, but it’s for 10 people and you just need to feed a few? It happens to me all of the time, and I end up googling how much is half of a tablespoon, and then how much is a half of a fourth of a cup…it ends up taking FOREVER! Well, I decided to make myself a little kitchen conversion chart that shows how to cut a recipe in half, and I wanted to share it with you! You can save this chart to your computer by right clicking and choosing the save option, then you can print it and keep it in your kitchen if you like. Or…pin it to your Pinterest account and pull it up on your iPhone, iPad laptop or tablet any time you need! 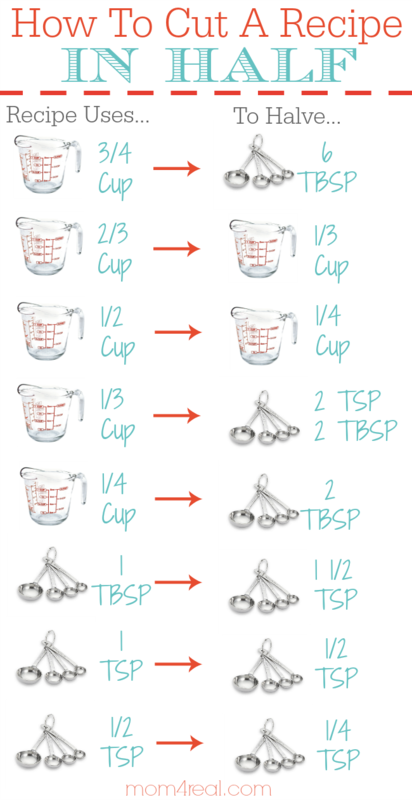 I hope this little kitchen chart helps make cutting a recipe in half for you! to cut down our favorite family recipes that feed an army down to more manageable amounts. how do you cut a recipe in fourths? Jessica, I teach 7 – 9th-grade students how to cook. This how-to will help a lot! So happy I could help! I love teachers…keep doing an amazing job!